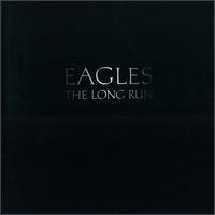 The Long Run is the sixth studio album by the Eagles, released in 1979. This was the first Eagles album not to feature founding member Randy Meisner, who was replaced by Timothy B. Schmit. The album was originally intended to be a double album to be released in 1978 but was instead demoted to a single album. Some of the tracks that were left off the album would be cobbled together to compose the cut "Long Run Leftovers" which appeared on the band's 2000 box set Selected Works: 1972-1999. Some of the bits in "Long Run Leftovers" were resurrected by Joe Walsh on "Rivers (Of the Hidden Funk)" from 1981's There Goes the Neighborhood and "Told You So" on 1983's You Bought It, You Name It. Also, the band recorded a Christmas single during the sessions. First of which was a cover of "Please Come Home For Christmas" by Charles Brown, which was released as a single in November 1978. The song's B-side was a Don Henley and Glenn Frey original called "Funky New Year" which was the band's song about the pitfalls of celebrating New Year's Day. The Long Run took almost two years to complete and saw the Eagles move in a more hard rock direction that they started going in with its predecessor, 1976's Hotel California. When released in September 1979, The Long Run debuted at #2 on Billboard's Pop Albums chart and a week later hit #1 dethroning Led Zeppelin's In Through the Out Door and was the last #1 album of the 1970s where it reigned for eight weeks and has sold over seven million copies to date in the US alone (it was certified Gold and Platinum in early 1980 by the R.I.A.A.). The album spawned three Top 10 singles, the chart-topping rocker "Heartache Tonight", the album's opening title cut and the ballad "I Can't Tell You Why". Those singles reached #1, #8, and #8 respectively. The band also won another Grammy for "Heartache Tonight". "In the City", is a song first recorded by guitarist Walsh for the soundtrack to the movie The Warriors. "The Sad Cafe" and "Those Shoes" received radio airplay, as well.